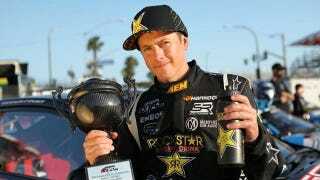 Formula Drift announced today that Tanner Foust would be retiring from the drifting circuit after a race in Abu Dhabi later this month. The reasons? A full plate of other work, including television. More Top Gear USA, anyone? "This was a hard choice to make, but with my schedule looking even busier than last year's I will not be able to fully commit to the 2011 Formula DRIFT season." Formula Drift said that schedule includes "European Rally events, X-Games and television responsibilities." There hasn't been any official green light for a second season of Top Gear USA yet, but its doubtful Foust would clear his schedule without some promises. Hopefully, it's not just more Supercars: Exposed.